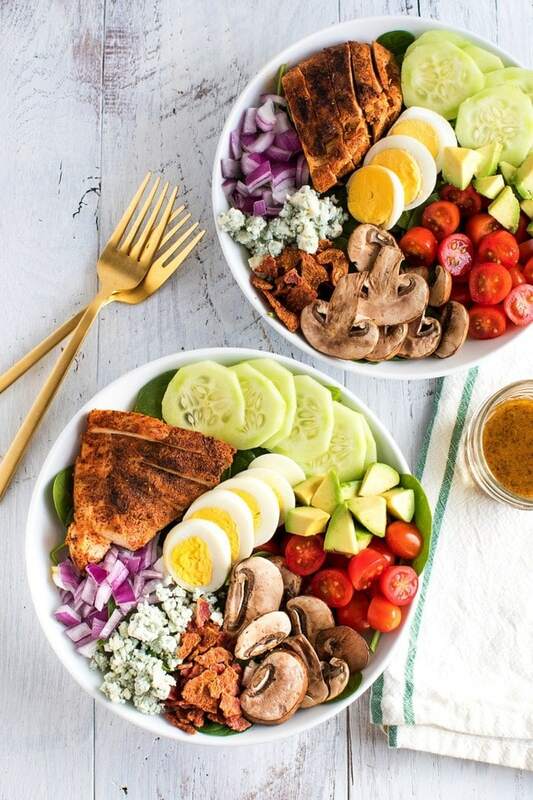 This blackened chicken Cobb salad tops the charts in my book. I love how much flavor is packed in each bite and how simple it is to create. Bonus points: it’s a great salad to prep ahead of time! Paleo, grain-free, low-carb and keto-friendly. As you all know, I’m on a mission to make salads an exciting, sought-after meal. We’ve all been in that position where we regretfully ordered a salad because we thought it was the “healthy choice” (I say regretfully because chances are it was a boring salad with not a lot of flavors going on). Or for some strange reason we decided to look up the nutrition facts after the meal and realized that the “healthy salad” we ordered had double the calories, sugar and fat than the burger and fries our friend ordered. UGH! We’ve all been there, but this blackened chicken Cobb salad couldn’t be more different. It’s loaded with tons of delicious flavors, but they’re portioned out so the salad is still uber healthy. Plus it’s so easy to make and so tasty! It is my new favorite #saladeveryday salad. Yep I went there… favorite! If you’ve never had blackened chicken or shrimp or anything really, I highly recommend it. It changes what could be a bland protein into a flavor explosion in every bite — but without a ton of added fat or calories. It’s just a simple spice mixture that takes the dish up 20+ notches. And there’s no need to marinate in advance, so you can make this meal on the fly. More often than I would like to admit, I plan on making a lunch or dinner and realize an hour beforehand that the recipe calls for 8+ hours of marinating. Don’t have time for that on the regular! Back to this epic blackened chicken Cobb salad recipe — it’s winner for a variety of reasons. For one, it’s a great salad to prep ahead of time — just add the avocado and dressing the day you plan to eat it. And it is a meal! There’s a great balance of protein, healthy fats and veggies which makes it an awesome option for lunch but also hearty enough for dinner. It’s also super easy to customize and make your own! Don’t like tomatoes or mushrooms? Skip them or swap them out for a different vegetable. Prefer pork bacon over turkey bacon? You do you! 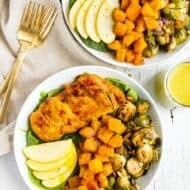 Looking for a paleo-friendly meal? Leave off the blue cheese. 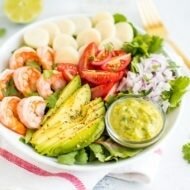 Looking for a keto-friendly, low-carb meal? Don’t have to change a thing! The red wine vinaigrette is really light and lets the ingredients in the salad shine, but feel free to experiment with different dressings. 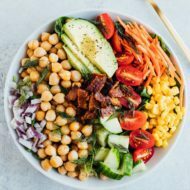 I’m currently hooked on my turmeric tahini dressing and it’s lovely over this Cobb salad as well. Paleo, grain-free, low-carb and keto-friendly. Nutrition facts are calculated without dressing. Take chicken out of the package and pat dry with paper towels. Add spices — paprika, garlic powder, chili powder, sea salt, black pepper and cayenne pepper — in a small bowl. Coat each chicken breast with spice mixture. To cook the chicken, you can either grill it on an indoor or outdoor grill or sear it on the stovetop. To sear: add 1 Tablespoon olive oil to a large skillet over medium heat. Place chicken breasts in hot oil. Cook chicken about 6–7 minutes on each side, or until juices run clear. Remove chicken from skillet and let sit for 5 minutes to cool before slicing for the salad. This step can be done a day in advance. While the chicken cooks, make the dressing by whisking together all the ingredients in a small bowl or glass jar. Divide the spinach or romaine among 4 plates (or containers if you’re making this for meal prep). 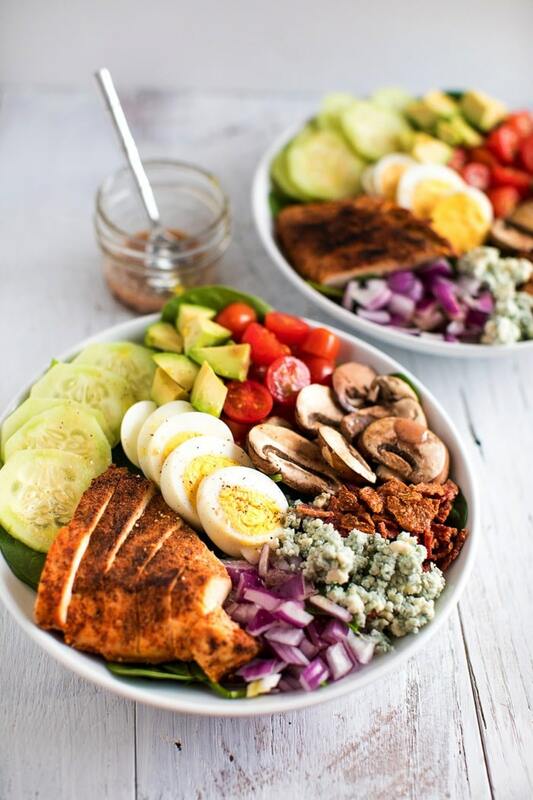 Arrange equal portions of blackened chicken, hard-boiled egg, tomatoes, cucumber, mushrooms, red onion, avocado, bacon and blue cheese on top of the greens. Just before serving, top salad with 1–2 Tablespoons of the red wine vinaigrette dressing or your favorite dressing. No time to make a dressing? Simply drizzle a little vinegar, olive oil, salt and pepper over your salad. Just a note, this salad is particularly delicious when all the flavors combine. I love using my OXO salad chopper to chop and mix everything together! 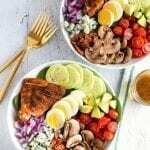 I can’t wait for you to try my new favorite blackened chicken Cobb salad. Be sure to tag me at @eatingbirdfood and hashtag #saladeveryday if you give it a go! This is fantastic! I read through this article and immediately forwarded it on to my mom. 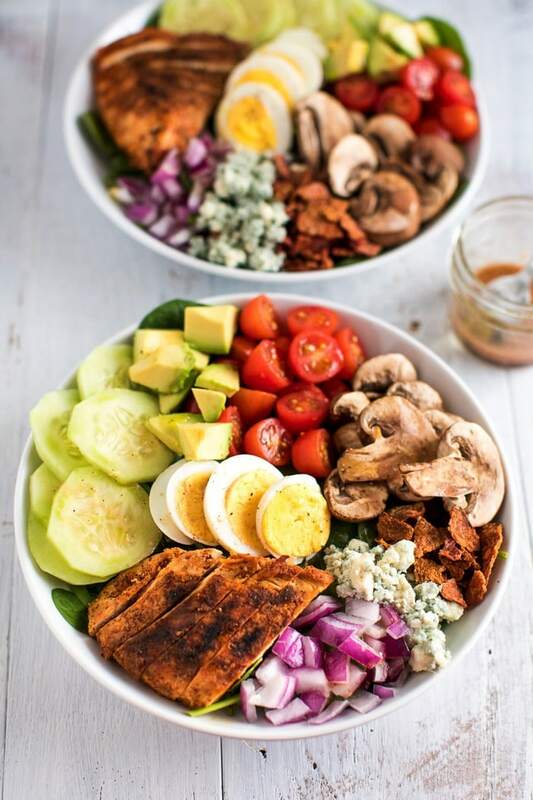 She is a huge cobb salad fan and I know she will be all over this! Thanks for the recipe Brittany! Wonderful! I hope your mom loves this Cobb Salad recipe. It’s an EBF favorite. How do you prepare the mushrooms? Do you simply sautee them in olive oil? I’ve been looking for a good way to cook mushrooms and no one seems to want to share their secret. Thank you! Hi Krystal. To be honest, I sometimes eat them raw because I like raw mushrooms BUT I’ve been told that you shouldn’t eat them raw so most of the time I just spray a pan with a little cooking spray (coconut or avocado oil) and sauté the mushrooms until soft (about 4-5 minutes), season with a little sea salt and pepper and enjoy. That said, I also love sautéed onions and mushrooms together as well, but I don’t usually make that for salads.